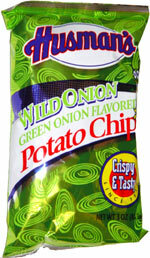 Taste test: These are good potato chips with a toasted and slightly sweet onion flavoring. The chips are indeed very crisp, just as it says on the bag. They've got some tiny green specks on them, but I think that's just parsley put there to make them look more green oniony. There is variety of crunch levels among the chips in the bag — some have a soft crunch, and others have a more impressive crunch when you bite it. It seems as if the chips in the bag aren't all of the same thickness, so different chips crunch in different ways.